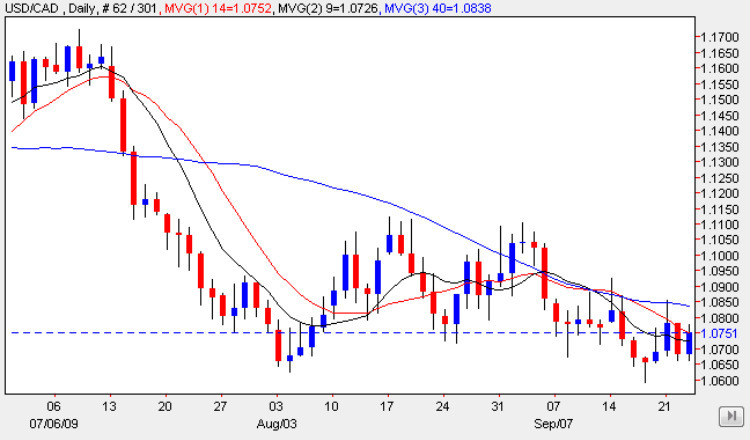 The usd to cad continues to try to establish a base at the 1.06 – 1.07 price level, with yesterday’s up candle reversing the move lower of Tuesday, and helped by the FED statement which suggested that the jobs market was still struggling to recover which in turn sent equity markets lower and the US dollar higher as a result. Whilst this US dollar positive sentiment is likely to be short lived, it did provide a much need boost for the usd to cad pair which continue to cling to this level with all three moving averages adding pressure to the bearish tone of the daily chart. However, should we see the 1.065 level breached in due course, then this could signal a much deeper move possibly as low as 1.02 which will then open to a re-test of parity in due course. With no fundamental news on the economic calendar for Canada today, the focus of attention for the usd to cad will once again be on the US markets following the FED decision yesterday, with US Home Sales and Unemployment Claims being the main focus, and indeed following the FOMC comments regarding the jobs market in their statement, these figures will be eagerly awaited for any confirmation of this view. The forecast for this afternoon is for a small increase on last week of 548,000 from 545,000 last time, and should this number be worse than expected then this could provide a further boost for the US dollar with a consequent reaction from equities.